What happens when a neurotypical and an Aspie collide? A profound lack of understanding, for one thing. “Aspie” is the self-designated nickname for those with Asperger Syndrome, a high-level form of autism that the American Psychiatric Association has deleted from its Diagnostic and Statistical Manual (a medical/psychological/behavioral bible), replacing it with Social Communication Disorder and categorizing it as a mild form of autism, along the Autism Spectrum. These days, the frequency of the autism diagnosis has skyrocketed to 1 in 57 births. “Neurotypical” or “neuronormative” is what Aspies call the rest of the population. So when bitter, snarky Senga gets an unexpected visit from a neighbor in her New York apartment building (nicely designed, uncredited, though you could probably fit three real New York apartments in the expanse of the stage), she’s in no mood for what she thinks is a stalker. She’s too busy feeling sorry for herself, and stuffing in fast food, pills and wine — to compensate for the fact that a serious knee injury caused by a car accident likely means she will never dance again — and that’s her passion, her profession and her first and only love. A bit stiff and odd, Ever comes in with a business proposition: ready with a wad of cash, he’s requesting one dance lesson, so he won’t look like a fool at the awards event honoring him. In “Dancing Lessons” (2014), playwright Mark St. Germain (many of whose works have been produced by Lamb’s Players Theatre, most recently, “Freud’s Last Session” and “Camping with Henry and Tom”) is making a case for compassion and empathy toward The Other, that is, anyone who’s not like you — meeting them on their own terms and trying to cross the divide. With Ever, Senga has a lot of accommodations to make. He displays all the classic signs of an Aspie (the term continues to be popular among Aspies): he is hypersensitive to sound and especially to touch; he has studied but hasn’t quite mastered the rules of conversation. He doesn’t understand facial expressions, irony, sarcasm or jokes. His speech can be robotic, and his thinking can be concrete and literal. But clearly, he’s exceptionally bright; he’s a Professor of Geoscience at the New York Institute of Technology. In his routinized life, he mostly gets along fine, although student questions sometimes receive brusque or seemingly insensitive responses (effective projections, lighting and sound by Ted Leib). Over the course of 80 funny and poignant minutes, Ever and Senga break down barriers for each other. Ever gets much more than a dance lesson, though we’re not given the neat, happy ending we might predict. Still, both parties come away better for having met. At Scripps Ranch Theatre, under the perceptive and empathic direction of Meg DeBoard (director of theatre at Point Loma Nazarene University), the piece is beautifully played for both laughter and pathos. 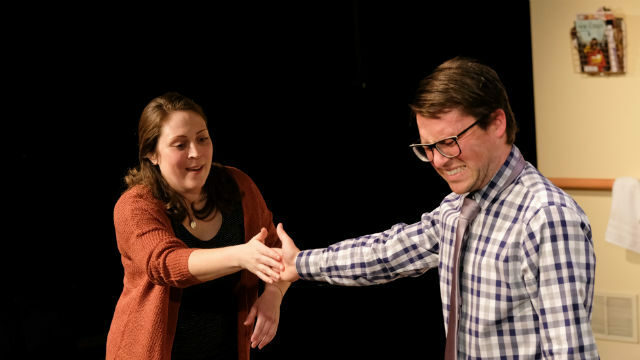 Michelle Marie Trester, a highly versatile local favorite, is marvelous as the prickly, defensive Senga, and Andrew Gumm (a high school teacher of theater and film) is spectacular as Ever; he perfectly captures both the intelligence and the sometimes self-aware social ineptitude. The actors (if not the characters) are extremely well matched. And aptly dressed, too (costumes by Danita Lee). You really should see this play — and you have more time to do so: after Scripps Ranch, it moves to Oceanside Theatre Company, which is co-producing. Consider it a funny escape if you want, or a meet-cute (of a sort), or a deeper contemplation of breaking down boundaries — your own and others’. Performances are Friday and Saturday at 8 p.m., and Sunday at 2 p.m. The production moves to the Oceanside Theatre Company March 1-17.